A cloisonné enamel vessel of baluster form and square section, supported on a tall, tapered foot and with a slightly flared rim. Each side of the vessel is divided into four sections by three horizontal bands with lingzhi fungus and bamboo leaf ornament. The uppermost section is decorated with plantain leaves; the shoulder section is filled in with intricate archaistic dragon motifs; the widest section of the body shows a large taotie mask; the lowest section is adorned with small swirl patterns. Each side of the foot is decorated with a winged horse, flying above wild waves amongst clouds. The decorative scheme is executed in colours on a turquoise ground. Four large gilt lion-head ring handles adorn the upper part of the body. The base is engraved with a four-character mark, reading Jingtai nian zhi (meaning ‘made in the Jingtai reign’). 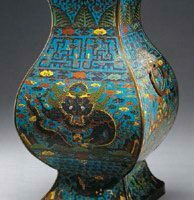 The form of this impressive cloisonné enamel vessel is of an archaic bronze wine vessel, fanghu (‘square jar’), which first made an appearance towards the end of the Shang dynasty, in the 12th century BC.1 The continuing preference for this archaic ritual form is evident in Ming and Qing times. A cloisonné enamel vessel in the form of a fanghu, closely comparable in decoration with dragon and phoenix motifs in the widest section, is dated to the Ming dynasty, first half of the 17th century, and in the collection of the National Palace Museum, Taipei (fig. 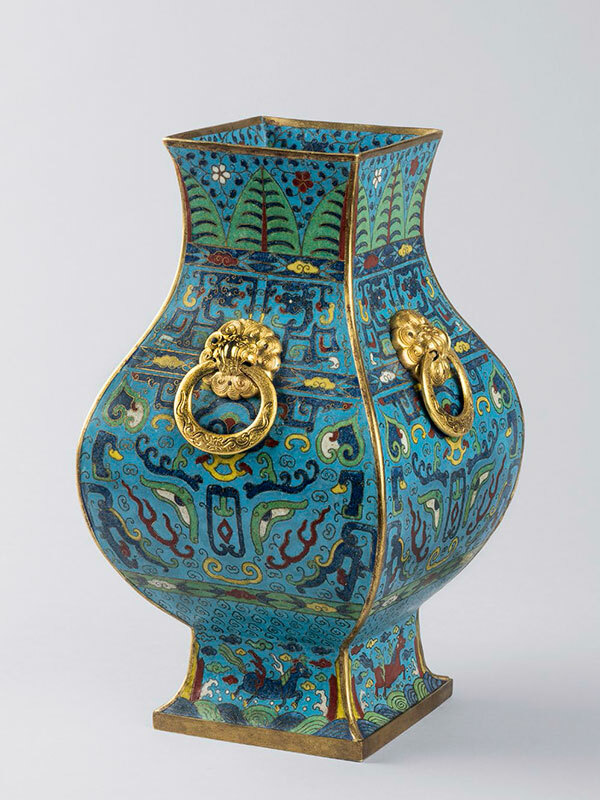 1).2 Another similar example of comparable shape, pattern and design, dated to the Kangxi period, second half of the 17th century, and is in the Pierre Uldry collection.3 Brinker describes the dating of the cloisonné enamel fanghu in the Uldry collection: “on the one hand, the cloudlike scrolls on a narrow band above the foot and the sea-horses (haima) speeding across the waves, often similarly depicted on Wanli pieces, suggest a dating to the first half of the seventeenth century—that is, to the late Ming dynasty. On the other hand, the geometric pattern of the dragon design placed between two bands decorated with bamboo leaves, the two lingzhi ornaments on the neck, and the dragon presented in frontal view are characteristic decorative motifs of the Kangxi era.” 4 The similarity between the Uldry’s fanghu and the current example would indicate a late Ming to early Qing dating. The mark of the Jingtai emperor (1450 – 1456) is a retrospective addition and not uncommonly found in the late Ming to Qing period.